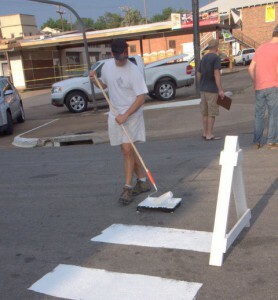 In Oak Cliff, Texas, community members initiated the process of right-sizing their street by orchestrating a temporary street re-design event. Photo from Go Oak Cliff. It used to be that only transportation professionals decided how wide a street should be. Not anymore. Communities of all shapes and sizes are beginning to play a larger part in determining the design and network of their street system. This new, active role helps ensure that transportation projects contribute to broad community outcomes, including local social, economic, and environmental well-being. One primary way in which communities are playing an active role in the planning process is through grassroots efforts to “right-size” local streets. These right-sizing efforts take the form of low-cost experiments that are intended to demonstrate potential benefits of place-based transportation and informing long-term decision-making. Right-sizing is a technique to re-design streets to make them context sensitive. Through right-sizing, streets can be transformed so they are safer, sustainable, and more functional from a mobility and a community perspective. For more detail on some examples of right-sizing techniques, read this recent post on Safer, More Livable Streets through Bike Lanes, featuring PPS Transportation Initiatives Director, Gary Toth. When it comes to right-sizing a street, there are several approaches that range in cost, time commitment, and impact. Of all these approaches, community-led and action-oriented tactics are consistently lighter, quicker, and cheaper than traditional, capital-heavy alternatives. Around the country, and with a little help from organizations such as PPS, The Street Plans Collaborative, and Go Oak Cliff, community members are realizing that the network of streets permeating their neighborhoods are not sacrosanct territory, but are public space that they can play an active role in planning and shaping. One example of community-led right-sizing is the Build a Better Block project in Oak Cliff, Dallas, TX. By leveraging local creative talent, creating a retail space program, engaging the public, and cooperating with local government, the organizers of the event held a very successful right-sizing and community revitalization event - but with the long-term impact of demonstrating a new permanent vision for that particular block, and for similar streets throughout the community. Oak Cliff is not alone in leading right-sizing efforts. Communities in disparate places have mobilized to launch similar community-led right-sizing events such as Houston, Waco, Memphis, and Oyster Bay, Long Island. In fact, in Fort Worth, Texas, the experimental traffic and bike lane configurations that Fort Worth's Build a Better Block effort first showcased are now being made permanent in four areas of the city's Near Southside. More than just street fairs, Build a Better Block events can demonstrate the power of temporarily re-envisioning a particular block and provides inspiration for streets around the community- and country. Each event has focused on a different issue, with varying degrees of success. But one thing each event had in common is that they brought the community together around a visible demonstration project that helped to communicate their goals to fellow community members, and to local agencies. This new trend of community-led right-sizing has a great deal of potential to change the results of traditional street planning/design. By allowing the community to alter the street, even temporarily, a high-yield experiment is carried out that in one short period of time. And the positive impacts aren’t limited to improving traffic flow. Recently, PPS helped facilitate a community-driven right-sizing effort in Brunswick, Maine. As part of our project with the city to develop a Placemaking master plan for downtown, we worked with the city and an involved group of citizens, to temporarily right-size Main Street in order to test concepts that had been floated in community workshops we facilitated earlier in the week. 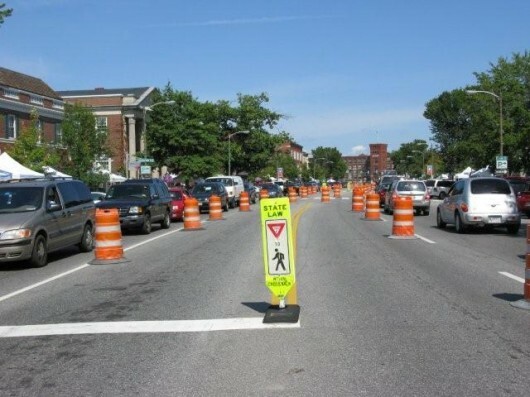 Citizens in Brunwick, ME experiment with street widths to measure traffic impact, as well as a potential increase in usable public space. By using orange cones - so, not exactly what you’d call heavy and expensive infrastructure - the community narrowed Main St. by two lanes to see how the flow of traffic would be altered, and to help visualize how the street could be redesigned so it worked towards the Placemaking goals for Main St., while also providing adequate throughput for cars. We’ve seen Dallas do it. We’ve seen Brunswick do it. Other communities are planning an event as we speak. So, how can you improve your streets? Do you want to learn about how right-sizing can advance your livable transportation agenda? Are you working on a right-sizing effort in your community? Do you have lessons to share?